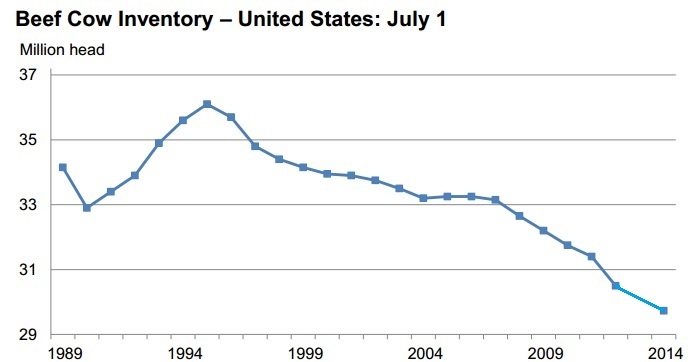 Latest reports from United States Department of Agriculture (USDA) shows that the national cattle herd has declined 3% since mid-2012 to 95 million head, which is the lowest figure for this series since it began in 1973. According to analysis by EBLEX the number of cows and heifers recorded to be on the ground that have calved gives an indication to the direction of the herd growth, or contraction. As at July 1, this figure was 39 million head, 2% lower than two years ago. Beef cows declined 3% to 29.7 million head, while dairy cow numbers increased a modest 1% to 9.3 million head. EBLEX says the lower breeding stock numbers indicate it may be some time before the US cattle herd returns to an expansion phase, although there has been a substantial decline in the proportion of the cattle kill made up of females so far this year, suggesting some intentions for rebuilding. However, it also says the number of heifers destined for beef breeding replacements fell 2% and those for dairy replacement fell 5%. EBLEX outline that the USDA data indicates that 2014/15 will be another year of tight cattle supplies in the US. It says cattle and calves available for slaughter on feed lots totalled 11.6 million head, a fall of 6% on 2012. In addition, the number of calves born in the first half of 2014 is estimated to be back 2% on the same period a couple of years ago, as the impact of the smaller breeding herds continued to be evident. As a result of the shrinking US cattle herd, its largest beef processor Cargill has decided to close one of its beef plants in Wisconsin that employs 600 workers and has the capacity to process 1,300 to 1,400 animals daily. Cargill said it made the decision after an 18-month analysis of the region’s cattle supply. “The harsh reality is that the US beef cattle herd is at its lowest level since 1951, with any significant herd expansion being years away,” said John Keating, president of the company’s Cargill Beef division, which is based in Wichita, Kan.
EBLEX highlight as a result, lower beef and veal production this year and next is likely to continue to translate into historically high beef prices for consumers. The US is one of the largest exporters of beef globally. Consequently, developments in the cattle herd have the ability to influence the global market to some extent.